June 2018 – ColePowered Games Ltd. In this dev blog I’ll be talking about how the game is progressing, the first pass of interface graphics and design, as well as a few new ideas I have. 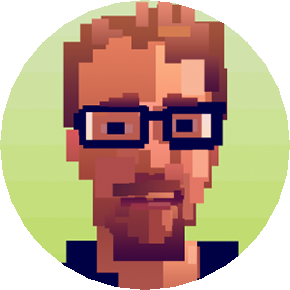 For the art style, I’m going with pixel art for 2D interface graphics, mixed with voxel style 3D buildings and 2D sprite characters. I’ve always been fond of the pixel art style, the interface reminds me of the management genre’s golden age in the 90s (memories of Bullfrog games spring to mind). One fear, however, is that it’s not an ideal fit for the amount of information I need to display on screen- it’s a fine balance I’m going to have to get right. This is my first time designing pixel art UI, and adjusting to the size/scaling restrictions has taken some patience! 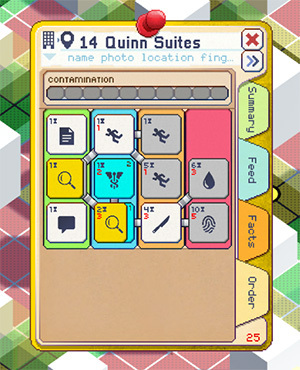 Currently, there are isometric and top-down view options only. I’m going to have to make the game pretty anyway, and the 3D city is right there, with all the citizens in their simulated glory. Why not just let the player walk the streets in those phases of ‘time passing’? All it would need really is a basic FPS controller. I think being able to walk the streets could add a real connection to the city and its population. How cool would it be to spend your time waiting reading the morning’s newspaper in the greasy spoon across the street over coffee? Or staring out your rainy office window overlooking the city while you wait for your agents to perform an interrogation of the prime suspect. There’s something irresistibly noir about that, and I’m going to have to pursue it to some degree. Especially since the game already requires a lot of those assets to be suitably detailed and constructed in 3D anyway. I’m not talking copious amounts of detail here by the way. What I’m picturing is noir pixel art style 3D similar to explore ’em up game Bernband. Trouble is this is a potential huge rabbit hole in an already-ambitious project. Where do you stop? If you can do this, why not just let you go to the crime scenes and do everything yourself like a true first-person detective game? As awesome as that sounds, the line will have to be drawn in the sand somewhere. At the moment, the first person element is purely going to be an optional ‘time waster’ element that lets you feel more immersed in the game world. It’s going to be a challenge of course to create this world. At the moment the city is procedurally generated using a semi-but-not-overly complex system involving building density and zoning. For now I shall iterate on that generation, but later on, I’m leaning towards having the city as more of a designed element of the game. 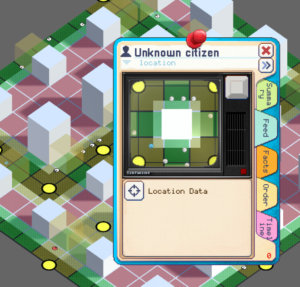 A city level editor at a later date would be a great inclusion, opening the game up to user-created cities, while keeping procedural cities as an option to the player. I’m going to be pursuing that ‘optional’ design philosophy throughout the game. For example, all documents will also be procedurally generated and there for the player to read if they want to- but they don’t have to. The useful bits of information are summed up in a handy list-style subsection, and represented by visual icons (think if somebody has summed something up via bullet points). 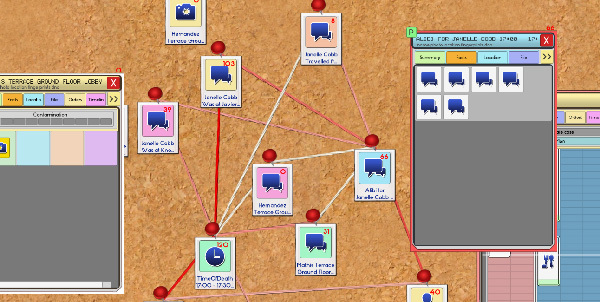 It’s really easy and digestible for the player– especially since the icons can link to another bit of evidence. Mouse over them and they’ll tell you the fact; “Joe Burns lives at 3 Cedar Drive”. Click on it and it’ll bring up the file for Cedar Drive (or Joe Burns if you are clicking on it from the Cedar Drive file window). But the extra detail is there for those that really want to get lost in the case- you can read the rental agreement between Joe and his shady landlord that the ‘fact’ came from. I love games like Deus Ex and The Elder Scrolls games where, if you want to, you can spend hours reading books- or more typically notes and other forms of interaction between NPCs. The love of those moments is one of the reasons I decided on this idea as my next project, and I plan to fill Shadows of Doubt with the same kind of detail.